Corporate blogs have become de rigueur in the social and content marketing worlds as vehicles to build authority, share insights, foster community and provide value. As an integral part of your marketing portfolio, it’s more important than ever to truly put some elbow grease into making your blog the best it can be. If you’ve already got the basics down, but you’re looking to take your corporate blog to the next level, come join us! Last month, we started a new series, asking you to submit your corporate blog for some free advice from Convince & Convert. This month, we share with you our first review: Voyageur Outward Bound School. We have developed a keyword strategy that informed 52 blog titles that we are publishing weekly with staff writing the posts in their own voice and unfortunately the posts are not receiving comments or being shared as much as we would like. First off, VOBS is doing a lot right. Its blog is doing many of the things we suggested in our previous blog post such as sharing varied points of view (including experts), and using compelling images that complement the text. However, there are definitely opportunities to make it more engaging. Use and implement categories. For readers visiting your blog via search or links from other sites, clear navigation can keep them browsing the site instead of bouncing if they don’t see the information they need right away. Adding categories to your blog posts (and a “Categories” widget on the sidebar of your blog) that are relevant to your audience is one way to add clarity. For VOBS, categories might include “My Campsite Story” (personal stories) or “Expert Tips” (tips on kayaking, camping, etc.). Consider the options for sharing. Currently, readers can share blog posts on VOBS via Facebook, Google+, LinkedIn, and email. However, if VOBS finds that certain social channels get less play than others, it should tweak the options to suit its audience’s needs. Images are currently pinnable on the blog, which is great, but having a “Pin” button in the “Share this” menu can be more obvious for the casual user. VOBS currently uses pull quotes to break up its blog posts (which is a great way to make longer blog posts more visually interesting), but what about adding a “tweet this” option to make those quotes instantly shareable? Make the calls-to-action clearer. On the blog’s index page, the “Comments” link is very hard to see (a light gray). An easy fix is to change the CSS to make the “Comments” button say “Leave a comment” when there are zero comments or “Read 2 comments” when there are comments. Likewise, the placement of the “Read more” button is a little counter-intuitive above the blog post excerpt. Place it at the end of the blurb and use color to make it more compelling—again, this is an easy CSS change that will make it more likely that the reader will click through. Cross-link to related content. Currently, there aren’t many links to other parts of the VOBS website and/or other websites from the blog. This is an easy way to add value to (and affect the bounce rate of) the blog. Consider adding related links (whether simply having authors manually write a bulleted list of 3-5 related blog posts and linking to them or using a WordPress plugin) to create opportunities for your audience to discover related content. The power of pictures. We all know that visual content has become a mainstay in content marketing. This is true on Twitter, Facebook and – yes – your corporate blog. The VOBS blog uses photos in many of its posts but lays them out as you would expect to see in a newsletter. Today’s blog reader is not yesterday’s newsletter reader. Often times, your reader expects an entire storyline – or at least the salient points – from images. If a reader (who is actually browsing, not reading) has to read the text and scroll down a page to see your images, you run the risk of losing them. 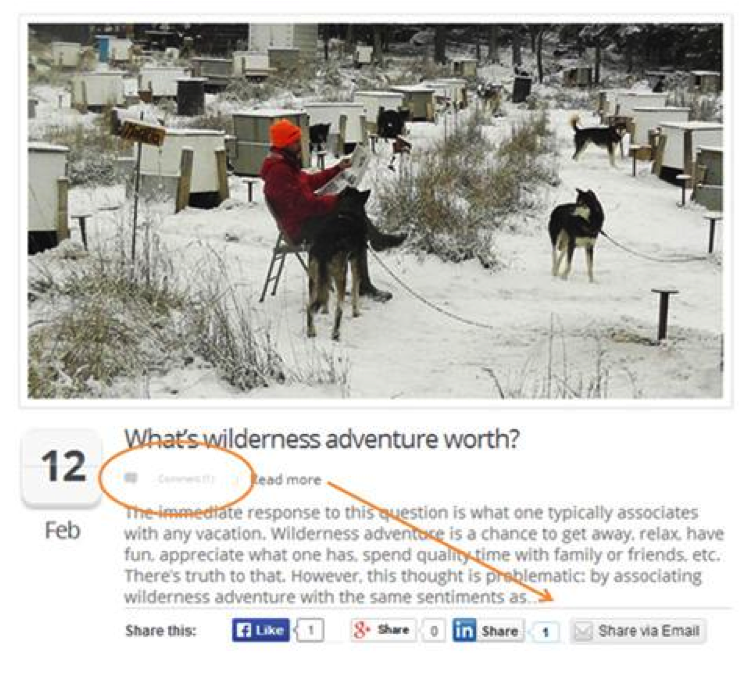 Use slideshows at the beginning of posts to provide readers the opportunity to see your story. Develop content from social suggestions. VOBS is on Facebook, Twitter, Google+, Flickr, YouTube, Pinterest and LinkedIn. That’s seven platforms that can provide hints for the VOBS blog. Often times, when a company or brand is active in social media, most energy is spent creating content, building an audience and responding to comments on that platform. The cycle then repeats. Not everyone thinks to use those platforms as resources for content ideas. Social content that gets higher than normal engagement is a tip-off for a post idea. If a fan or follower poses a question that warrants more than a tweet or Facebook response, write a blog post. If there’s a question that is asked with regularity, answer it with a blog post. It’s a given that social media is a platform for two-way dialogue, but many organizations miss the opportunities that are presented to them through their social audiences. VOBS doesn’t have to be one of them. Attract interest with headlines. We know writing headlines isn’t easy. It’s downright tricky. How do you inform and hook and make a clear promise to your reader in 68 characters? Writing headlines is like solving a difficult crossword puzzle: You often take a stab at an answer (in pencil, mind you) and then take a step back to make sure it’s the right one. The VOBS blog has great attempts at headlines and others that need some work. For example, in the post titled “10 Essential Sea Kayaking Tips,” the reader knows what information they will learn if they commit to reading the post. However, the title “Grit is Key, But How do You Learn It?” is vague and leaves the reader guessing whether or not they will find value from the post. Guesswork is your enemy. It puts your reader in a position to decide whether or not the post will be valuable. You want your headline to eliminate as much guesswork as possible. We recently posted a number of headline-writing tips that can help VOBS modify its approach. Define your editorial approach. When Richard wrote in to Blog Rescue, he told us one of his goals was to use the blog as a positioning platform. VOBS wants to be seen as a thought leader in its industry, using the blog to demonstrate the power of its programs and the organization’s understanding of the people it impacts. This is the first step in developing a long-standing editorial approach. As an organization, you have to be able to articulate what it is you want to be seen for and known as. Once you do that, you can start to think about the storylines that make up that aspiration. Our Convince & Convert team creates content pillars for clients that can be applied to a single platform or to an entire content program. The role of content pillars is simple: they guide your editorial approach and content creation. In addition to defining content pillars, VOBS should look at the tone of its content. For a parent in search of solutions for a teenager lacking confidence, what’s going to resonate? A VOBS instructor speaking about how to develop character in young kids, or the perspective of a once-angry teen who realizes he’s capable of more than he ever thought possible while on a canoe expedition? These are the kinds of questions that need to be asked: 1st person vs. 3rd person. Slideshow post vs. text-based post. Essay style vs. a list post. Always think about different ways to tell a story, to demonstrate a point and to connect with a prospective customer. Social integration. Your content should never live in a vacuum. A blog post has life beyond a blog. As mentioned, VOBS has seven active social media platforms, but the blog could be better integrated into each. Jay said it earlier this week: You have to market your marketing. Develop a promotion plan for your blog that looks at unique ways to integrate your blog content with your social media platforms. Think about how one of your blog posts should be presented on Facebook, Twitter, Google+ and Pinterest. It should vary. Don’t take a copy and paste approach. Each of those platform’s have different audiences, and those differences should be considered in your promotion plan. We’ll select submissions* and will share our thoughts in future Blog Rescue editions.